BootstrapThemes.me : a marketplace for Twitter Bootstrap Themes! What is Twitter Bootstrap ? Twitter Bootstrap is a front end framework (free and open source) for web designers/developers. With bootstrap you can easily create cool looking awesome designs with HTML5, CSS3 and jQuery (cool? yeah!). If you’re a web designer/developer, then bootstrap may save you a lot of time, instead of working from scratch, you can start working on the top of a solid foundation (960 px grid, styles for buttons, tables, forms etc, jquery plugins, responsive etc comes along with Twitter Bootstrap). Twitter Bootstrap gives you a solid foundation to begin, by default it looks cool for mockups and prototypes but the default look is not good for final release. That’s where bootstrap themes comes in. There are already few marketplaces for Twitter Bootstrap Themes ? Why another one ? at, BootstrapThemes.me, designers get 70-80% of the sale. 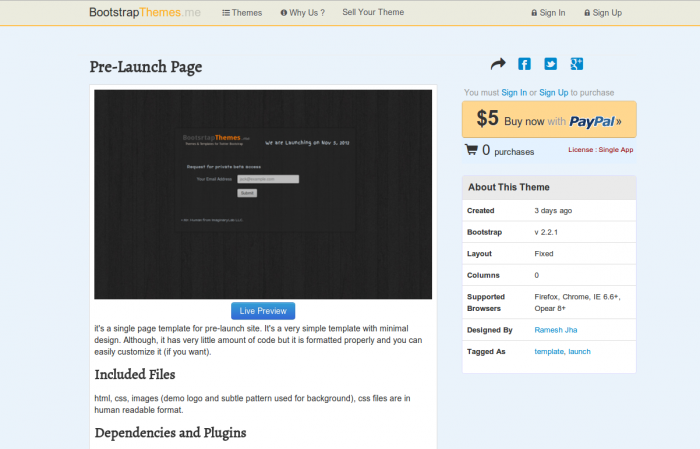 visit BootstrapThemes.me for Bootstrap goodies! UPDATE! It’s closed now. But you can checkout my other site about portfolio templates.